Enter Steve Aoki. Based in Los Angeles, Aoki released his debut studio album, 'Wonderland', a week or so ago and he'll be bringing the record to a handful of UK venues in the spring. 'Wonderland' neatly caps a characteristically intriguing rise for Aoki. Born into a family of artists and entrepreneurs, many of whom ended up suing each other over multi-million dollar business empires, Steve Aoki began his DJ and production career hosting gigs in his room at the University of California. He founded his own label, Dim Mak Records (named after 'Dim Mak' - the 'Death Touch' - in honour of his idol Bruce Lee) in 1996 and spent a decade or more building a reputation as a club DJ, producer and remixer before releasing his debut mix album 'Pillowface and His Airplane Chronicles' in 2008. Like Aoki, new record 'Wonderland' and the UK tour promise much. 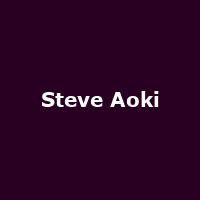 Steve Aoki's short UK tour kicks off at the Manchester Academy on 2nd April, followed by gigs in Birmingham and, finally, Camden's KOKO on 4th April 2012. We will have tickets available when they go on sale at 9am on Friday 20th January, priced £15 for Camden and £14 for Manchester and Birmingham. Ahead of the UK shows, Aoki is appearing at the Dublin Academy on 31st March. We have tickets on sale now, priced €29.